Take one (1) capsule once or twice daily (morning and evening) with or without food, or as recommended by a healthcare practitioner. Aside from relieving everyday stress and promoting restful sleep, this botanical extract may also offer smokers relief from the mental stress of quitting, aid in supporting healthy mood, and helps inhibit the emotional hunger associated with dieting (or following a calorie restriction regimen). Lemon balm is used for digestive problems, including upset stomach, bloating, intestinal gas (flatulence), vomiting, and colic; for pain, including menstrual cramps, headache and toothache; and for mental disorders, including hysteria and melancholia. Many people believe lemon balm has calming effects so they take it for anxiety, sleep problems, and restlessness. Lemon balm is also used for Alzheimer's disease, attention deficit-hyperactivity disorder (ADHD), an autoimmune disease involving the thyroid (Graves' disease), swollen airways, rapid heartbeat due to nervousness, high blood pressure, sores, tumors, and insect bites. 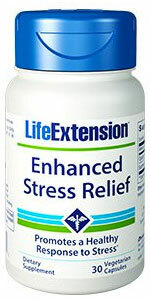 Based on an enormous amount of published data showing the multiple beneficial effects of lemon balm extract and L-theanine, Life Extension has combined these potent nutrients into a formula called Enhanced Stress Relief. 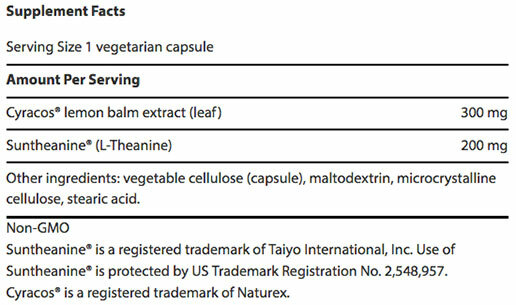 Note that the amount of L-theanine in this product is double that of most L-theanine standalone supplements. The reason for this potency increase is reports of greater benefit when at least 200 mg of L-theanine is taken. Beware of Imitations: The L-theanine used in Enhanced Stress Relief is Suntheanine®, the only pure form of L-theanine protected by 40 U.S. and international patents. Independent laboratory analysis has verified that certain other products on the market claiming to contain "L-theanine" are only half L-theanine, the other half being a different form of theanine known as "D-theanine" which has not been scientifically evaluated in published studies. Int J Essent Oil Ther 2007;1:143–152. Barnes J, Anderson LA, Phillipson JD. Herbal Medicines, 3rd ed. London: Pharmaceutical Press, 2007. Pharmacol Biochem Behav. 2002 Jul;72(4):953-64. Indian J Pharmacol. 2012 Mar-Apr; 44(2): 189–192. Pharmacol Biochem Behav. 2009 Jul;93(1):10-6. Trends Food Sci Technol 10 (1999), 199–204. J Physiol Anthropol. 2012 Oct 29;31(1):28. Biol Pharm Bull. 2002 Dec;25(12):1513-8. Free Radic Biol Med. 2009 Dec 1;47(11):1601-10. Biochem Biophys Res Commun. 2004 Jul 16;320(1):116-22. J Med Food. 2011 Apr;14(4):334-43. Biological & Pharmaceutical Bulletin, 25, 1513e1518. For orders, questions or assistance call (218) 363-6719. Copyright © 2019 Recipes for Life With Dr. Beth. All Rights Reserved.